Last night our world was covered in white, and it was so much fun to wake up to this morning. All fresh, clean, and bright! It made me think of how each day we get a new clean slate to fill up, each day is a new opportunity to go out there and be productive, be joyful, and serve others! But so often, we get bogged down in our day with clutter. Clutter in our personal lives and in our businesses can consume us! Are not doing us or our clients any service. What are some common things in your life and business that you find doing this? Too much endless Facebook browsing, getting stuck over on Pinterest? Or maybe just some serious mindset blocks that slow down our momentum. And I will admit, there are those days that I just need an attitude adjustment, heh. I need to choose joy, choose to be grateful, keep my chin up even though I am a mama running on 5 hours of sleep. Clutter can come in the shape of endless freebies that we download that aren’t really serving us. Or it could be listening to ten different people tell you how to run your business instead of working with one awesome coach. Clutter can be the piles of mail (or laundry!) we keep putting off. You need a system! 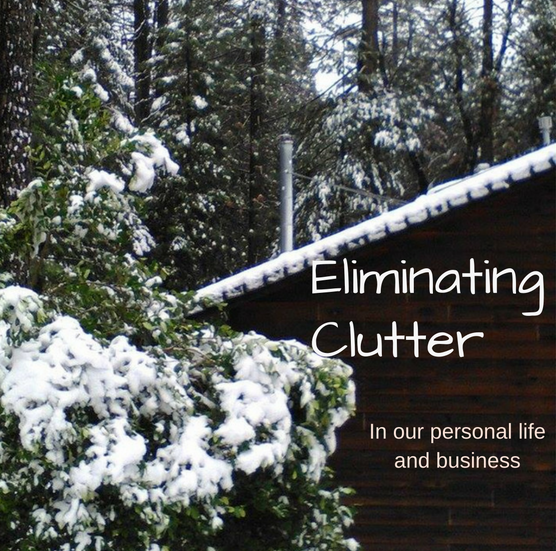 By getting organized you can eliminate clutter. Getting rid of the mess will help you with success! I don’t know about you, but when my home and work space are organized and clutter free, I am much happier and its so much easier to tackle the day’s work. In today’s business world, we have so many tools to choose from to save time and get rid of clutter. You need to find what works best for you. Get rid of those apps that sit on your phone and haven’t been used in 30 days, or those ones that are fun but are just time wasters. Another thing to ask yourself as an entrepreneur is: Are there low value tasks that are cluttering up your day that you can assign to a VA ? This will free up your time to maximize your value and profit. Do you have some favorite tools to share? Tomorrow I am going to be sharing with you some of my favorite financial and bookkeeping tools that can help streamline your business, save you time and eliminate chaos and clutter.